The Democratic growth is fueled by a new base of voters and an enthusiastic base of existing ones. Turnout in the 2018 Democratic midterm primary is matching that of turnout in the 2016 Democratic presidential year primary, while Republican numbers are virtually unchanged from 2014. Through early vote numbers on Sunday, voters have cast 186,796 votes in the Democratic primary compared to 177,166 votes in the Republican primary. 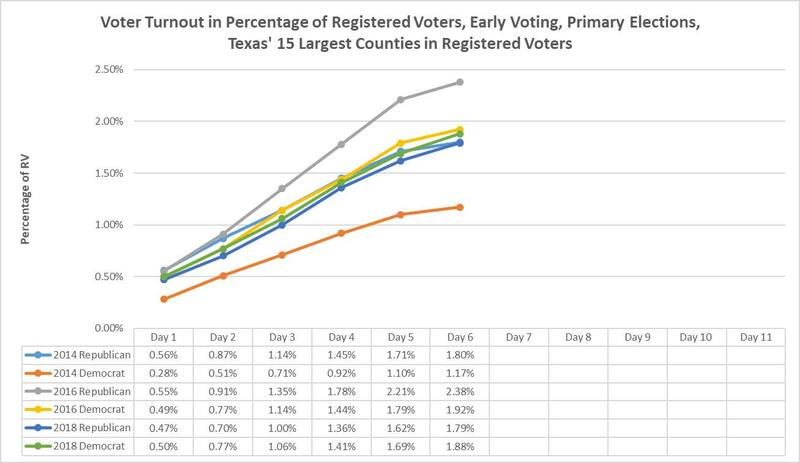 The graph below, produced using turnout data from the Texas Secretary of State, shows voter turnout trends from previous years and how they compare to this year. "The turnout numbers tell us two things - first that Democratic enthusiasm is translating into high turnout, and second that the Republican vote is stagnant," said Ed Espinoza, Executive Director of Progress Texas. "What this is producing is a margin that is fewer than 10,000 votes between the two parties, which is roughly 2.7 percent, with Democrats in the lead. This is the definition of a swing state." In the fall of 2017 Progress Texas published analysis called Special Report: Flipping Texas which takes note of Democratic voter growth and Republican voter stagnation. These early vote trends support the thesis put forward in that report. Added Espinoza: "With Republican turnout nearly identical to the previous midterm election cycle, one has to conclude that there is little crossover vote going on. The Democratic growth is fueled by a new base of voters and an enthusiastic base of existing ones."